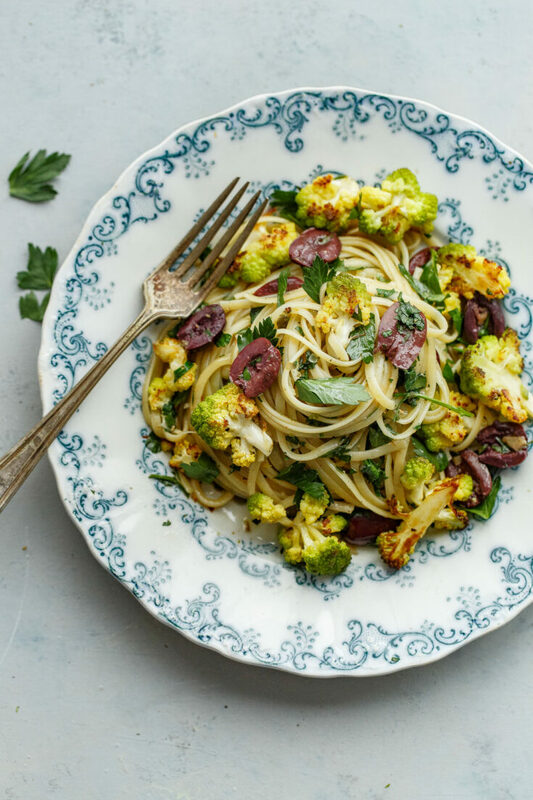 A simple and flavorful romanesco cauliflower pasta with parsley and bursts of saltiness from kalamata olives and briny capers. 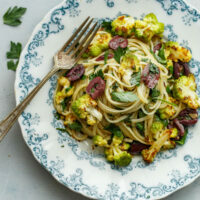 This vegetarian pasta recipe comes together quickly and can be easily adapted with regular cauliflower or other vegetables! It’s been a hot minute since I shared a new pasta recipe with you! As most of you know, my love for pasta runs very deep. 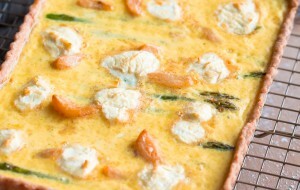 It is my favorite comfort food (far more than desserts and sweets!). While I love branching out with most foods, I have a tendency to stick with the same tried and true preparations over and over again. I’d call it a pasta rut, but we love them so much that we never seem to mind. 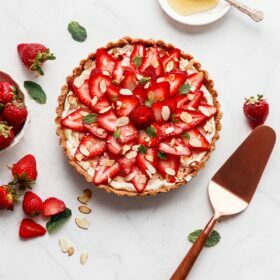 Either way, one of my goals is to branch out and get more creative with our weekly pasta dinners, particularly as spring and summer unfold and we’re greeted with endless fresh produce. 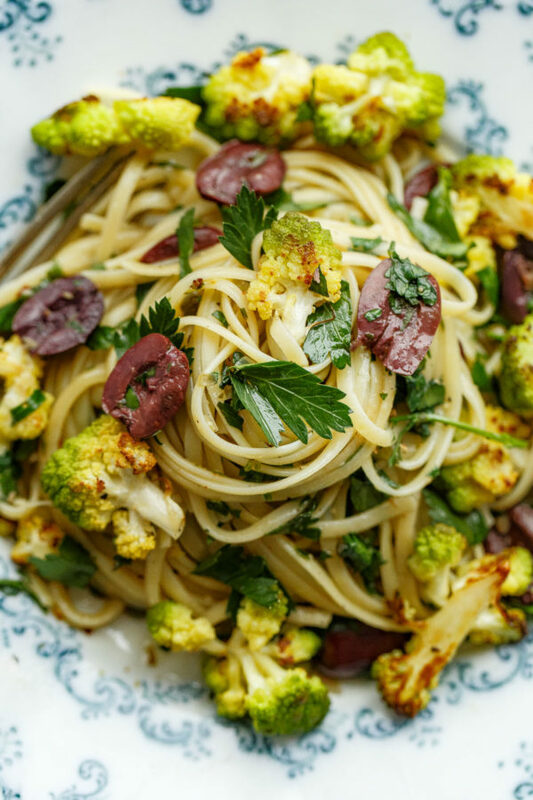 This roasted romanesco cauliflower pasta with olives, capers, and parsley (inspired by Alice Waters) is my latest creation. 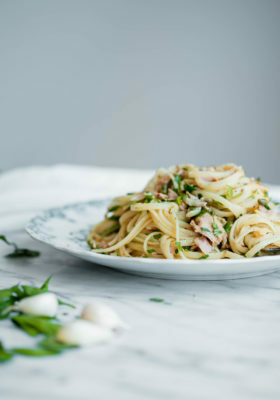 It is a flavorful, simple pasta recipe that can be adapted easily and changed with the seasons. Best of all, you can use this basic framework and apply it to almost any vegetable! Let’s start with the basics. Romanesco, commonly known as Roman cauliflower or ‘romanesco broccoli’, is very similar to cauliflower in both taste and appearance. You can cook it in exactly the same way, but I always prefer to keep the preparation simple to show off its appearance. While it looks similar to cauliflower, romanesco has a few differences. Romanesco is lime green in color, slightly more delicate in flavor, and the tightly clustered florets are spiral in shape. It is one of the most beautiful vegetables (in my humble opinion) ever, and I get very excited whenever I see them at the grocery store or on a restaurant menu. That being said, romanesco can be tricky to come by. Its season ranges from late fall to late winter. 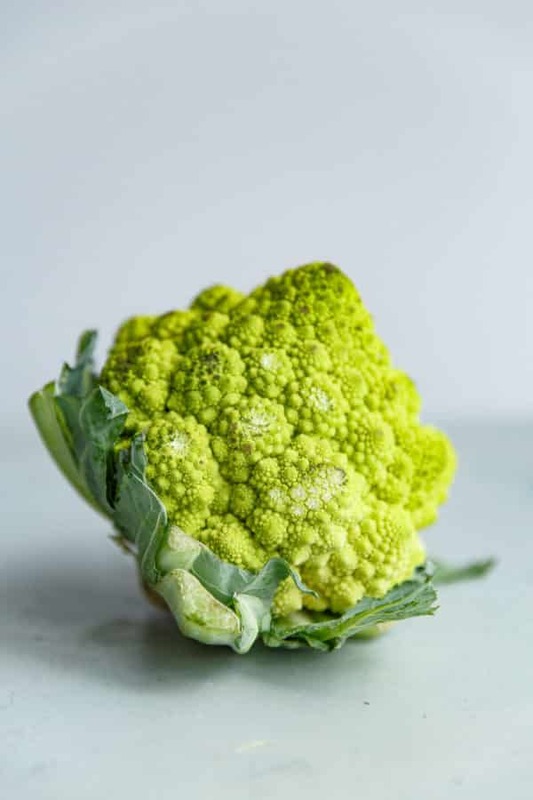 While romanesco will lend this dish a certain flair, please know that you can substitute it with regular cauliflower. The pasta will taste identical either way. 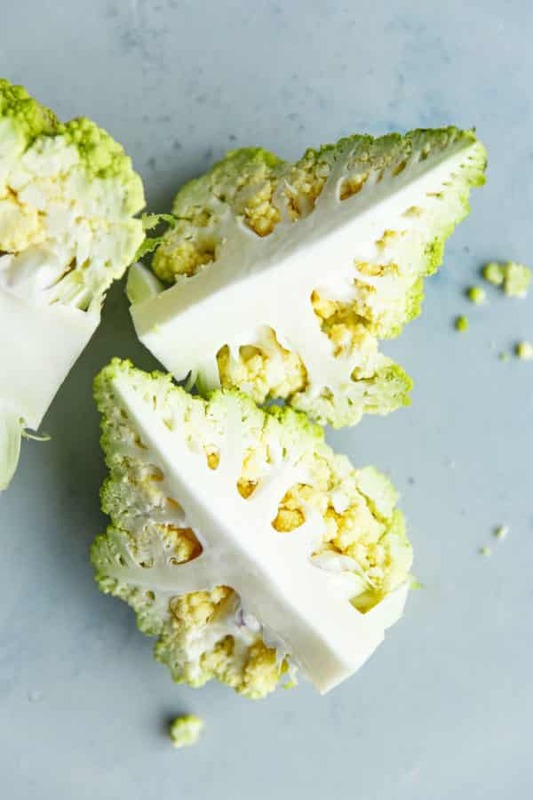 Romanesco may look a little different than your basic head of cauliflower or broccoli, but you’ll want to prep it in much the same way. Whenever I’m breaking down a whole broccoli or cauliflower, I start by removing the base and slicing the whole head in half through the base. Once I do this, I slice the halves into quarters. Standing each quarter upright and holding your knife at an angle, trim the florets from the core. Most of the florets will naturally break off and you can cut any remaining florets to match their size. 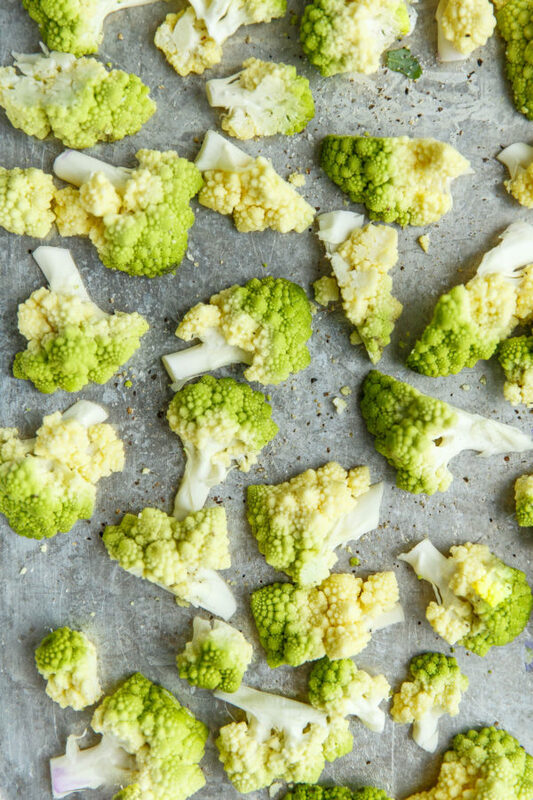 You’ll want to take the same approach with romanesco. For this pasta, you’ll want to keep the florets quite small (bite size, so they’re well integrated in the pasta!). 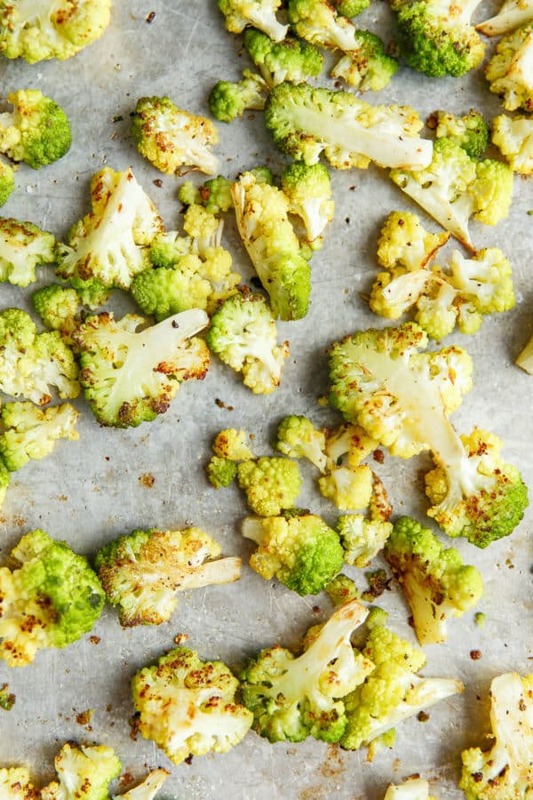 The romanesco florets are tossed with olive oil, salt, and pepper, and roasted at a high temperature until caramelized. I love to roast romanesco, because it concentrates the delicate flavor and allows the florets to retain their beautiful shape and look. 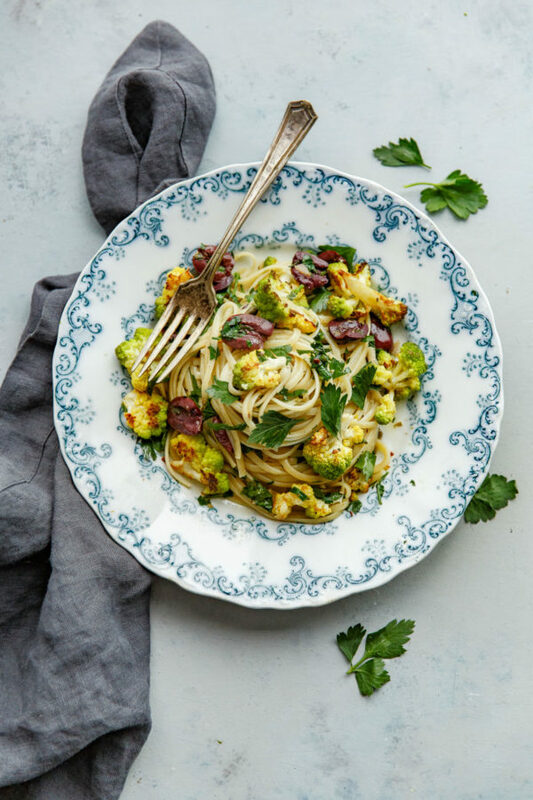 The rest of the components of this cauliflower pasta come together in less time than it takes to boil the pasta on the stove! Chopped garlic is sautéed in a generous amount of extra virgin olive oil in a skillet on the stovetop, then combined with sliced kalamata olives, briny capers, and a generous pinch of red pepper flakes for a touch of heat. The olives and capers add a touch of saltiness, which I love, to each bite. At the last minute, we’ll be adding lots and lots of freshly chopped Italian parsley. Don’t skimp on the parsley. It adds brightness and flavor to this simple pasta. You can certainly top this pasta with grated parmigiano cheese or keep it as is! 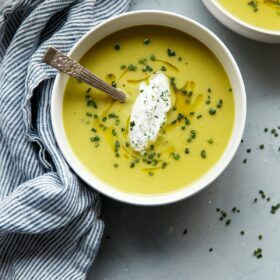 A little drizzle of peppery high-quality extra virgin olive oil would be excellent too. Preheat the oven to 450 degrees Fahrenheit with a rack in the center position. Trim and discard the base of the romanesco and cut it in half, then quarters. Standing each quarter upright and holding your knife at an angle, trim the florets from the core. Most of the florets will fall off or can be separated easily with your fingers (you want the florets to be no larger than an inch in diameter); cut any larger florets in half with a knife to match the size of the other florets. Place the florets on a half sheet pan and toss with 1 heaping tablespoon olive oil, kosher salt, and freshly ground pepper. Distribute the florets cut-side down into an even layer, making sure that the florets aren't touching one another if possible. Roast at 450 degrees for 15 to 20 minutes, tossing halfway, or until caramelized and tender. Meanwhile, bring a large pot of salted water to a boil for the pasta. Heat the remaining olive oil in a medium skillet over medium-low heat. Add the garlic and sauté for 1 to 2 minutes, stirring continuously, or until fragrant. Do not allow it to gain color. Add the kalamata olives, capers, and red pepper flakes to the pan, and sauté for an additional minute or until warm. Taste for salt and pepper. Add half of the parsley to the skillet and keep the mixture warm - off the heat - as you cook the pasta. Romanesco (which also goes by the name of Roman cauliflower) is in season from late fall to late winter. 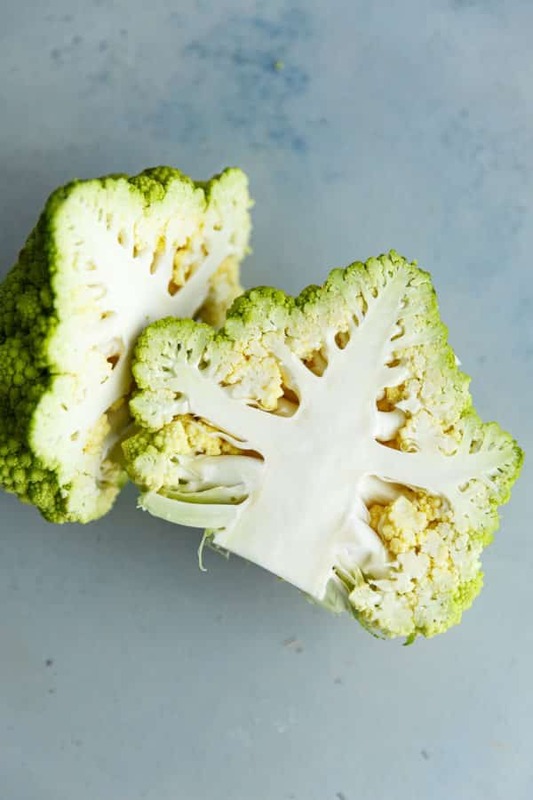 While romanesco will lend this dish a certain flair, it can be trickier to come by.Feel free to substitute it with regular cauliflower. The resulting pasta, while not quite as striking, will be very similar in taste! 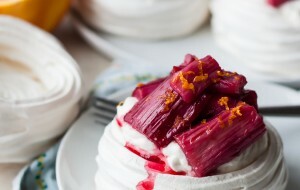 Inspired by Alice Waters, The Art of Simple Food. 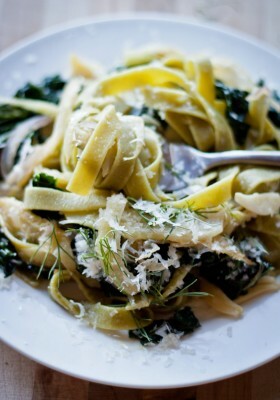 I have a weakness for pasta, too, and this is such a perfect dish for spring. Love romanesco but often intimidated by it so thank you for the how-to on chopping it up. Can’t wait to try!